When I started studying in London I vowed to hunt down the best places to eat in London and I may have been somewhat over ambitious. I not only have VERY little time on my hands between the hours of 9am and 6pm, but I also have very little money. This creates a bit of a dilemma. Nonetheless, on the odd day that I can escape out of the big glass building that is law school in order to grab a spot of lunch I am trying my hardest to seek out some of the yummiest food in the area. And, so far so good! 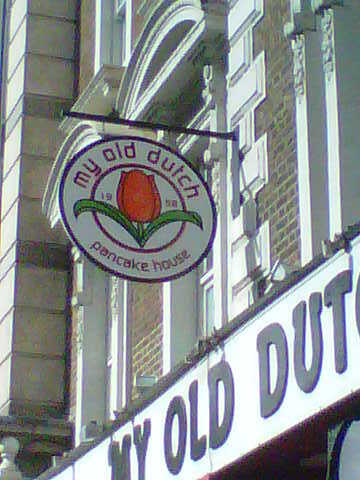 My first adventure out was to My Old Dutch – a pancake house just a few hundred yards west of Holborn Underground Station along High Holborn road. I am not entirely sure how this restaurant first came to my attention. In the first few weeks of law school I was googling away looking for interesting places to eat and it just suddenly appeared on my screen! A sucker for pancakes I knew this was the first place I was going to try. Some of you may remember from my food and drink guide to Nottingham that there was a wonderful breakfast diner called Warsaw Diner that did some rather spectacular pancakes, and I was hoping My Old Dutch would give them a run for their money. BUT, the first problem was that they’re not open until 11am…no good when you have lectures starting way before, though their breakfast menu looks amazing. So, instead I had to settle for a pancake lunch…never mind! It was super easy to find, bang smack on the main road, and had a bright and cheery sign outside – always a good start. I was promptly seated by a lovely waitress who grabbed me a drink – lemon iced tea – and handed me the menu. The food arrived in less than 10mins and I was soon overwhelmed by the portion size. The plate was HUGE! My photos really do not give justice to this monster of a pancake. The My Old Ducth savoury pancake – plenty for two! The pancake itself was light, airy, not at all greasy and there was a brilliant distribution of filling. Every mouthful was delicious. I must admit, I struggled to finish the pancake which disappointed me a little – I had my heart set on getting pudding as well, but my little stomach just couldn’t take any more! At £9.95 for the one, I would definitely recommend sharing one of these if you’re just after a light lunch. And from what I saw, sharing is recommended with a number of couples in the restaurant that lunch time ordering just the one pancake and sharing with little side plates each. I ordered another drink and was letting the food go down, casually browsing the sweet pancake menu, trying to decide if going for round number 2 was a good idea or not. I should’ve listened to my stomach but didn’t and soon I was ordering their new butterscotch pancakes with strawberries, blueberries, maple syrup and cream. This is what pancake legends are made of. The savoury pancake was impressive, but in my opinion a sweet pancake always wins, and this stack really was sensational. The fruit was tangy enough to cut through the super sweet maple syrup, and the cream added a rich indulgence to the pile. Beautifully presented, they didn’t skimp on the fruit, cream OR maple syrup – I really was in pancake heave…but stomach hell. Round two – sweet pancakes. I ALMOST finished my second course, but alas, they got the better of me. 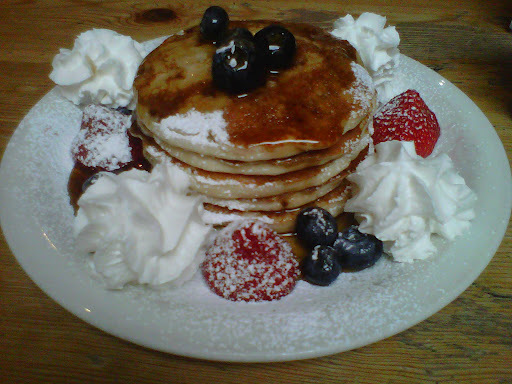 There were no complaints except that a petite girl of 4’11” cannot stomach two courses of their amazing pancakes. 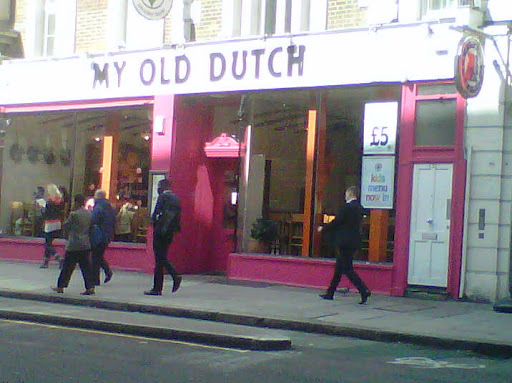 I feel this is more my parents fault than My Old Dutch’s…damn my genes! All in all, the food I had was delicious. When I return next – and I most definitely will return…my two course triumph got me TWO stamps on their loyalty card, YAY – I will just go for the one course. The atmosphere was so fun and carefree that I felt perfectly comfortable eating by myself. There was also such an eclectic mix of patrons that people watching kept me entertained as much as the music and art work did! Other favourite things about the restaurant – whoever runs their twitter feed is hilarious, I love their rustic plates (though perhaps the giant chip in the side was a step too far), and their drinks menu is just as extensive as their pancake menu with plenty of Dutch beers for those who like a tipple. So I bet you’re wondering how much a delicious feast like this will set you back. 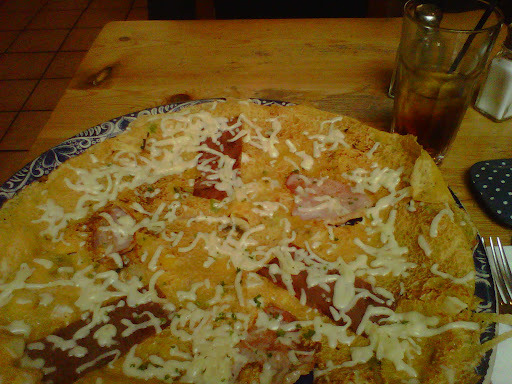 A GIANT savoury pancake will cost you around £9 and at that price I really do recommend you share with someone else – it’s always nice to split the bill! If it’s something sweet you’re after, pudding pancakes are roughly £7. Clearly it’s not the kind of place a student could afford to visit once a week for lunch – but it really is good value for money, so visiting once in a while as a special treat is a great idea! 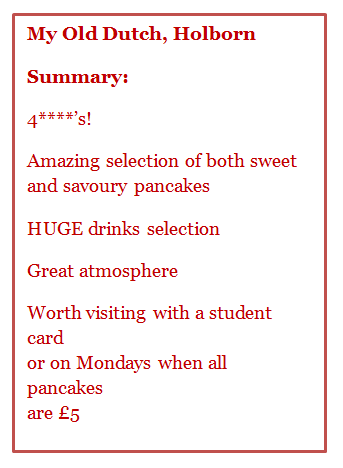 I maintain that if you are sensible and order just one round of pancakes; making use of the Monday Deal or the Student discount this amazing pancake house really does offer value for money. I am just a greedy gannet and got ahead of myself! For the sake of my waistline and my purse, it will not happen again.